Los Angeles (AFP) - Two-time defending champion Golden State had all five starters in double figure scoring and the Warriors maintained the best record in the Western Conference by clobbering the Indiana Pacers 112-89 on Thursday. 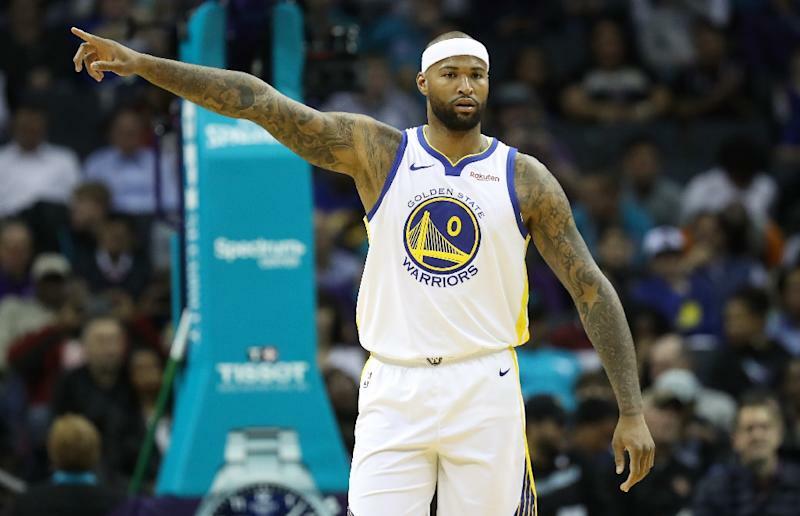 DeMarcus Cousins returned from a two-game injury absence to help lead a third quarter demolition as the Warriors held on to their half game lead over the Denver Nuggets for top spot in the conference. "We got the shots we wanted. The ball was just popping," said Golden State forward Andre Iguodala. "We haven't played as well at home this year so we want to finish it right." Indiana dropped to 44-29 and saw their lead over Boston (43-29) trimmed to a half-game in their fight for the fourth seed in the East. Golden State led 53-43 at halftime thanks to a 18-10 surge in the second quarter. They then busted the game open in the third quarter taking a 70-48 six minutes in and breezed from there. "Tonight I thought our spirit and our energy were fantastic," coach Steve Kerr said. Cousins, who finished with 19 points, missed the final two games of Golden State's just completed four-game trip with a sore ankle. Klay Thompson (18 points), Kevin Durant (15), Stephen Curry (15), Iguodala (11) and Draymond Green (10) also scored in double figures for the Warriors. Golden State outshot the Pacers 49 percent to 39 percent from the field. Elsewhere, Nikola Jokic tallied 15 points and 11 assists as Denver used a balanced attack to win their fifth straight game with a 113-108 victory over the Washington Wizards. Paul Millsap, Gary Harris, Jamal Murray and Torrey Craig added 15 points for the Nuggets, who were playing for the first time since punching their ticket to the playoffs on Monday in a win over the Boston Celtics. "I was really worried about this game just because of the hangover effect of clinching in Boston," coach Michael Malone said. "To pull this out, even though it wasn't pretty, speaks to our team and not being satisfied." Bradley Beal scored 25 points, Tomas Satoransky had 16 points and 10 assists and Thomas Bryant scored 22 in his first start in a month for Washington, who are seeing their playoff hopes dim after dropping their third straight. "You try to be optimistic about it, but realistic at the same time, too," Beal said. "It's tough when you're in the position where you need help from other teams. They're trying to make it just like we are."